Summer has begun in Estonia! I think everyone has adjusted to the time change now – Estonia is 7 hours ahead of US east coast time. However, I learned my lesson from last time when my cousin told me that “Estonian children don’t sleep in the summer!” Three years ago I kept trying to get the children in bed at a reasonable hour. This time around I have relented. I can’t tell you how cool the boys think going to bed at midnight is – especially when it is still light out! Now that they are a bit older and do not require my constant attention, it really isn’t an issue. The interesting thing I realized yesterday is, however, that when active boys are awake that much longer, they require to be fed again! So at 10:00, they were grilling apples and sausages on the fire. At the beginning of the day, my cousin’s husband, Mati, and two beekeeper friends showed us the family beehive and took the season’s first bucket of honey. There is nothing sweeter than fresh honey! My favorite way to eat it is simply spreading it on traditional Estonian black rye bread, sort of like a dark, dense sourdough. I expect that my clothes will not be fitting so well in a few weks! Sunday was a gorgeous day. Very fittingly it also marked the official start of summer in Estonia, literally. On June 21st, the mayor of Tallinn, the capital city, symbolically hands over the title of the Estonian capital to the mayor of Pärnu. 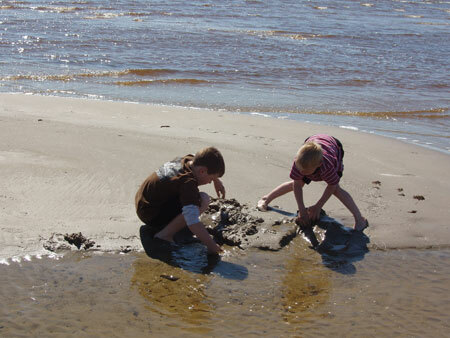 Pärnu is Estonia’s summer resort town and about a 20 minute drive from where we are staying. Many of the country’s political officials have summer homes here, so I suppose if they wanted, they probably could hold government session here, especially since a few years back, Parliament business officially went paperless. This is a very connected country! (More about that later.) 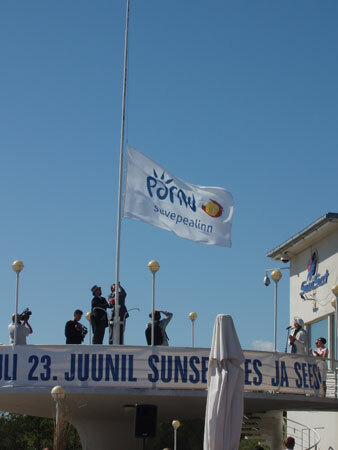 Anyway, we went to the beach to watch the flag raised to announce the start of summer. The water was a bit cold, but the boys enjoyed building a sand castle nonetheless. Pärnu’s long stretch of beach actually lies on the Gulf of Riga, a very shallow body of water, with very little wave and no undertow. A mother’s dream beach! The cildren can go quite far out with the water barely getting more than 3 feet deep. Being so shallow, we hope that before our time is up here, the water warms up a bit. On a lighter note – I’m off to hanging the laundry out to dry! This entry was posted in Estonia 2009. Bookmark the permalink.